Grant, we beseech thee, O Almighty God; that advancing in the science of the saints, after the example of blessed John, thy Confessor, and showing mercy to others, we may, by his merits, obtain mercy of thee. Through our Lord Jesus Christ, thy Son, who liveth and reigneth with thee, in the unity of the Holy Ghost, God, world without end. Amen. Kenty, the humble village of Silesia (Poland) which witnessed the birth of St. John, owes its celebrity entirely to him. The canonization of this holy priest, who in the fifteenth century had illustrated the university of Cracow by his virtues and science, was the last hope of expiring Poland. It took place in the year 1767. Two years earlier, it was at the request of this heroic nation that Clement XIII had issued the first decree sanctioning the celebration of the feast of the sacred Heart. When enrolling John Cantius among the saints, the magnanimous Pontiff expressed in moving terms the gratitude of the Church towards that unfortunate people; and rendered to it, before shamefully forgetful Europe, a supreme homage. Five years later Poland was dismembered. John was born at Kenty, a town in the diocese of Cracow; and hence his surname Cantius. His parents were pious and honorable persons, by name Stanislaus and Anna. From his very infancy, his sweetness of disposition, innocence, and gravity, gave promise of very great virtue. He studied philosophy and theology at the university of Cracow, and taking all his degrees proceeded professor and doctor. He taught sacred science for many years, enlightening the minds of his pupils and enkindling in them the flame of piety, no less by his deeds than by his words. When he was ordained priest, he relaxed nothing of his zeal for study, but increased his ardour for Christian perfection. Grieving exceedingly over the offences everywhere committed against God, he strove to make satisfaction on his own behalf and that of the people, by daily offering the unbloody Sacrifice with many tears. For several years he had charge of the parish of Ilkusi, which he administered in an exemplary manner; but fearing the responsibility of the cure of souls, he resigned his post; and, at the request of the university, resumed the professor’s chair. Whatever time remained over from his studies, he devoted partly to the good of his neighbour, especially by holy preaching; partly to prayer, in which he is said to have been sometimes favoured with heavenly visions and communications. He was so affected by the Passion of Christ, that he would spend whole nights without sleep in the contemplation of it; and in order the better to cultivate this devotion, he undertook a pilgrimage to Jerusalem. While there, in his eagerness for martyrdom he boldly preached Christ crucified even to the Turks. Four times he went to Rome on foot, and carrying his own baggage, to visit the threshold of the apostles; in order to honour the apostolic See to which he was earnestly devoted, and also (as he himself used to say), to save himself from purgatory by means of the indulgences there daily to be gained. On one of these journeys he was robbed by brigands. When asked by them whether he had anything more, he replied in the negative; but afterwards remembering that he had some gold pieces sewn in his cloak, he called back the robbers, who had taken to flight, and offered them the money. Astonished at the holy man’s sincerity and generosity, they restored all they had taken from him. After St. Augustine’s example, he had verses inscribed on the walls in his house, warning others, as well as himself, to respect the reputation of their neighbours. He fed the hungry from his own table; and clothed the naked not only with garments bought for the purpose, but even with his own clothes and shoes; on these occasions he would lower his cloak to the ground, so as not to be seen walking home barefoot. He took very little sleep, and that on the ground. His clothing was only sufficient to cover him, and his food to keep him alive. He preserved his virginal purity, like a lily among thorns, by using a rough hair-shirt, disciplines, and fasting; and for about thirty-five years before his death, he abstained entirely from flesh-meat. At length, full of days and of merits, he prepared himself long and diligently for death, which he felt drawing near; and that nothing might be a hindrance to him, he distributed all that remained in his house to the poor. Then, strengthened with the Sacraments of the Church, and desiring to be with Christ, he passed to heaven on Christmas Eve. He worked many miracles both in life and after death. His body was carried to St. Anne’s, the church of the university, and there honourably interred. The people's veneration for the saint, and the crowds visiting his tomb, increased daily; and he is honoured as one of the chief patrons of Poland and Lithuania. As new miracles continued to be wrought, Pope Clement XIII solemnly enrolled him among the saints, on the seventeenth of the Kalends of August, in the year 1767. 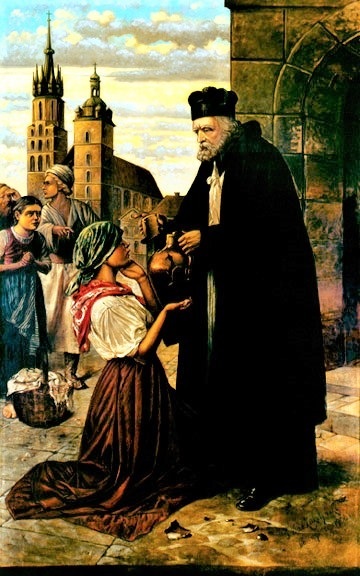 St. John Cantius, pray for us.